Time to start another project. This one is based on harvest. It’s pickle time! These pickles are going to be fermented first for about 3-6 weeks. 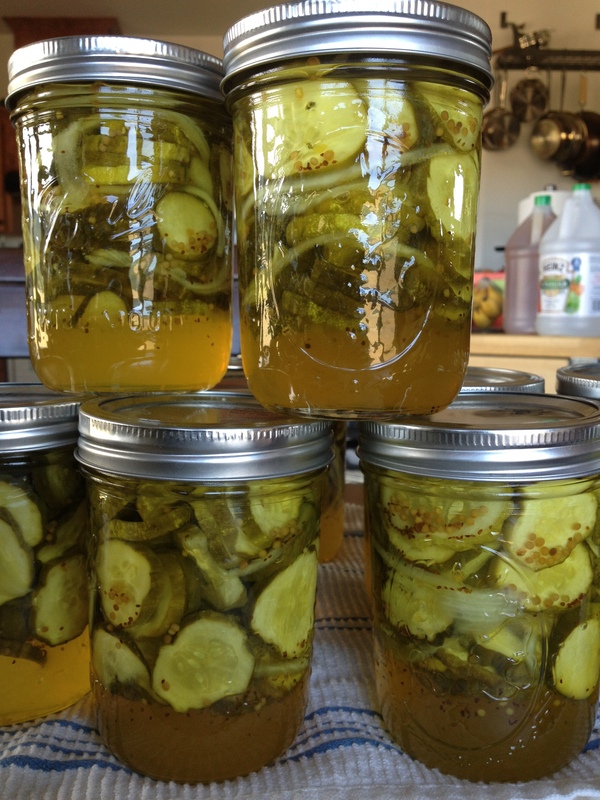 The recipe is – 4-5lbs pickling cucumbers. They should be about 4″ long. 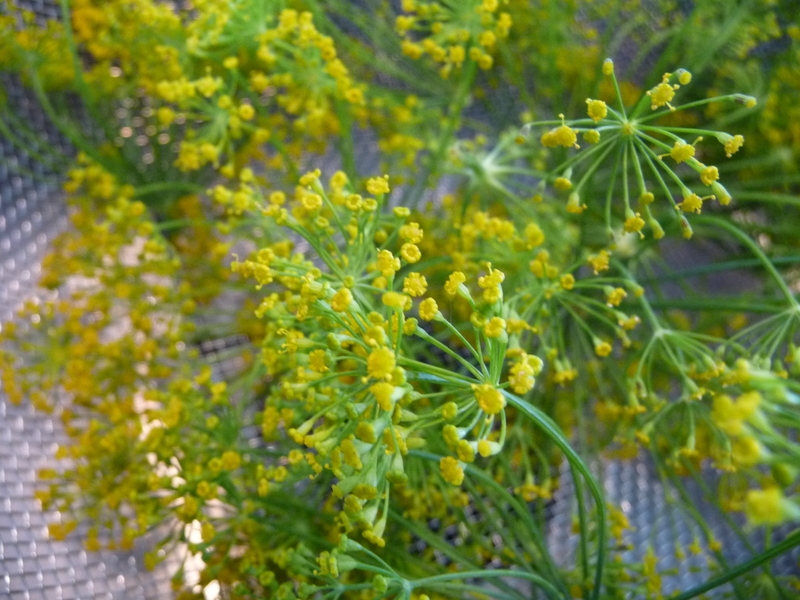 5 dill fresh blossoms. 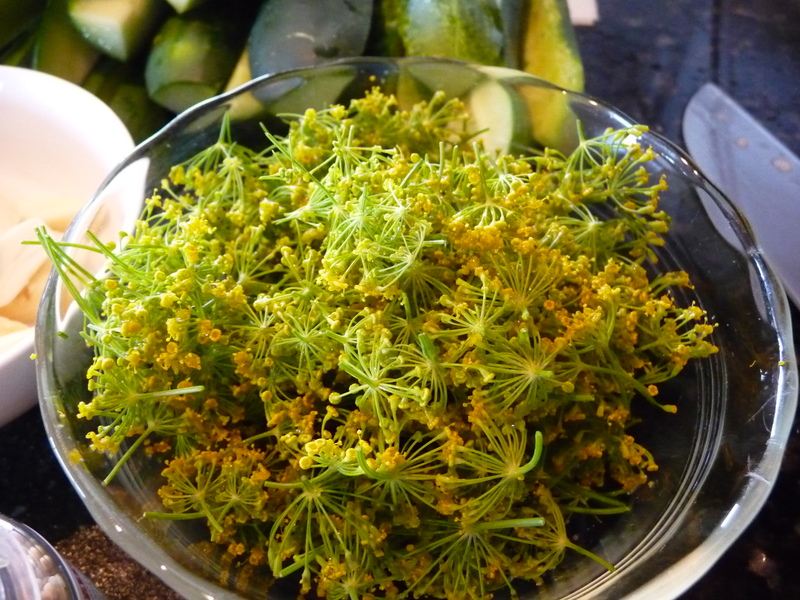 You can use dried dill instead of fresh 2 Tbs. Wash the cucumbers in room temperature water. Then be sure to cut about 1/16″ off the blossom end. Start with the freshest cucumbers you can get. These I grew and harvested this morning. 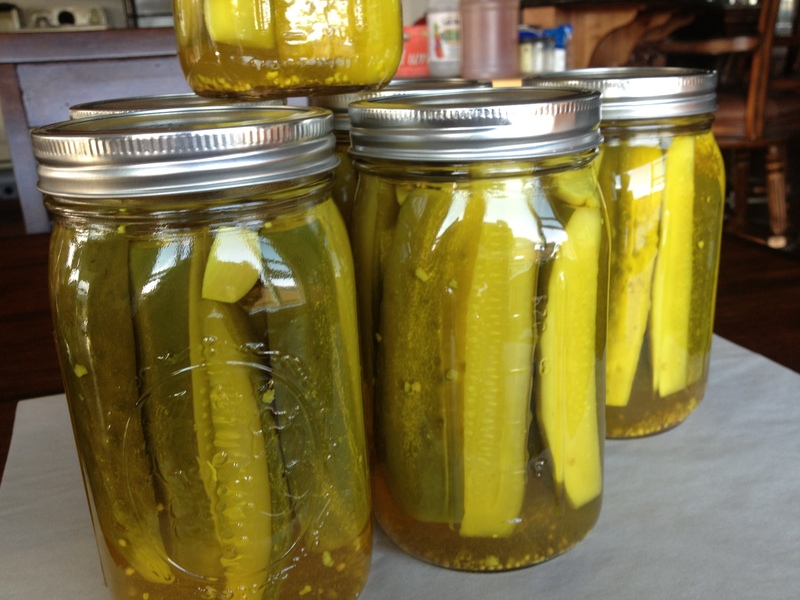 The blossom end has enzymes that will make the pickle soft and sometimes unsafe to eat. Dissolve salt in water and vinegar. 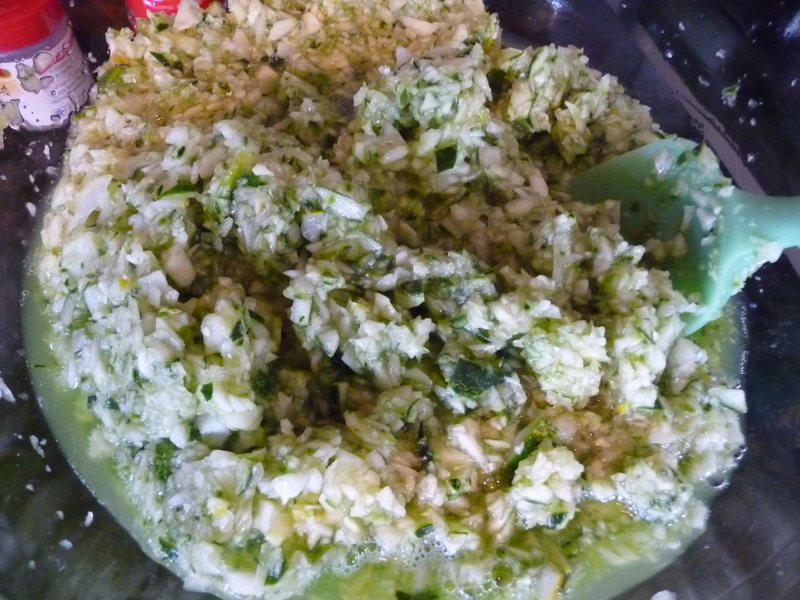 Layer your cucumbers into a crock (mine is a 2 Gal), add the garlic, chili’s and dill and cover with the brine. Be sure to weigh the cucumbers down so they are below the liquid. Put in a cool place 70-75 degrees is best. Check them often as you may need to skim the top of the brine as scum will form. After 3 weeks it’s time to start seeing how they’re doing. They should be olive green in color, but not soft or slimy. So I always thought that a great burger had to be grilled over hot coals to have the savory and juicy goodness when we think of an awesome hamburger. Oh lordy was I wrong! Folks please never put limits on yourself as I did. But allow me to back up about 30 years. So while my folks didn’t know it, but when frying burgers salt and pepper are the only seasonings you should use. I had no idea my folks were so avant garde. Let’s get to the awesomeness of the burger for the night. First off we have so many fresh, out of the garden ingredients going on here. The hamburger itself is from the side of beef we bought. Next up we have 3 cucumbers I cut up and pickled for the night in cider vinegar, pickling spice, salt and fresh dill I grew along with homegrown lettuce for our burgers. Next to our dinner is fresh picked cherry tomatoes and a ball squash. I started by making my pickles so they’d be ready for dinner. 1 Combine cider vinegar with 1/2-cup of water, salt and pickling spice in a small saucepan. Heat to a boil. 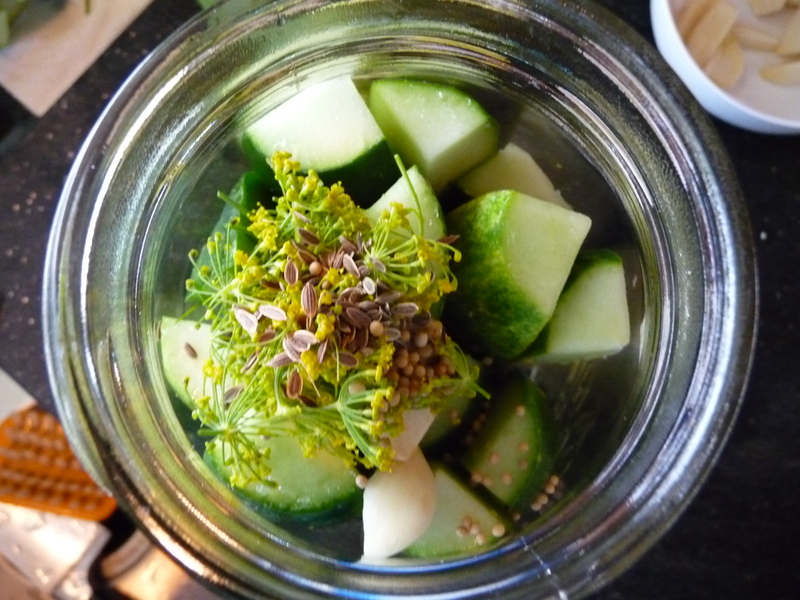 2 Place cucumber in a clean, dry glass container just large enough to hold all the slices. Pour boiling brine over cucumber slices to cover completely. If all cucumbers are not submerged, add cold water to cover. Cover; refrigerate at least 1 hour. Pickles will keep for about 10 days. I chilled these for 2 hours before we put them on the burgers. They had an ever so slight sweetness to them but the crunch and pickle flavor was such a superior flavor than any store bought pickle. For our dish you will need one ball squash, about 1/2 cup of small cherry tomatoes and 2 cloves of garlic. Take a ball squash (they look a lot like a zucchini but they are round and about 5-6″) Slice into slices about 1/4 inch thick. Take about a tsp of kosher salt and salt one side. Let these sit for 10 minutes. You will see a lot of moisture build up. This is a good thing as it’s drawing the moisture out so they will crisp up. After the 10 minutes, use a paper towel and wipe them off to remove the moisture. Let sit again until the burgers are done. Wash and dry tomatoes and slice the garlic in thin slices. The hamburgers were the most basic of burgers. But the offered an enormous amount of flavor. Sorry no more ingredients are needed. Put the meat in a bowl, add salt and pepper and mix thoroughly with your hands. Then simply form 4 patties no more than 4 ounces each. 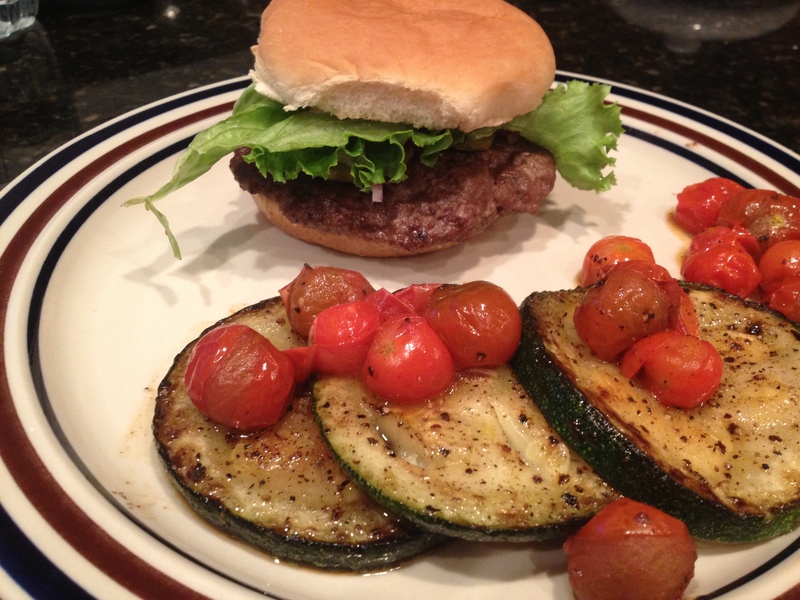 The patties should be pretty thin, they will be about 6″ diameter but will shrink to 4″ when cooked. Get your iron skillet heated up to just below the smoking point. Add your patties and cook on high for about a minute. They will get nice and brown. Now flip those tasty meat patties over and cook them for another 5 minutes on med-high heat. Pull them and cover them for the next 8 minutes while you make the squash/tomato side dish. In the same pan as the hamburgers were cooked, use a paper towel and absorb all but about a tablespoon of the pan drippings. Add your squash and brown for about 2 minutes. Turn squash over, put the garlic and tomatoes in and add some fresh cracked pepper and about 1/4 cup water. (keep your stove fan on at least medium as there will smoke and steam). Let the tomatoes cook for about 2 minutes or until they just start to burst. Turn the heat off. So for our burgers I believe simple buns are the best. If you need fancy buns your meat is not the star. I toasted ours for about a minute and then added a mayo mixture of – 1/2 cup Mayo, 2 Tbs worcestershire sauce, 2 tsp mustard, salt and pepper. A bit of ketchup, homegrown lettuce, red onion and homemade pickles. Wow what a meal! The squash dish was so magnificently seasoned from the pan drippings the hamburger meat provided and the tomatoes brought such a nice sweetness to the dish. Folks I must challenge you. 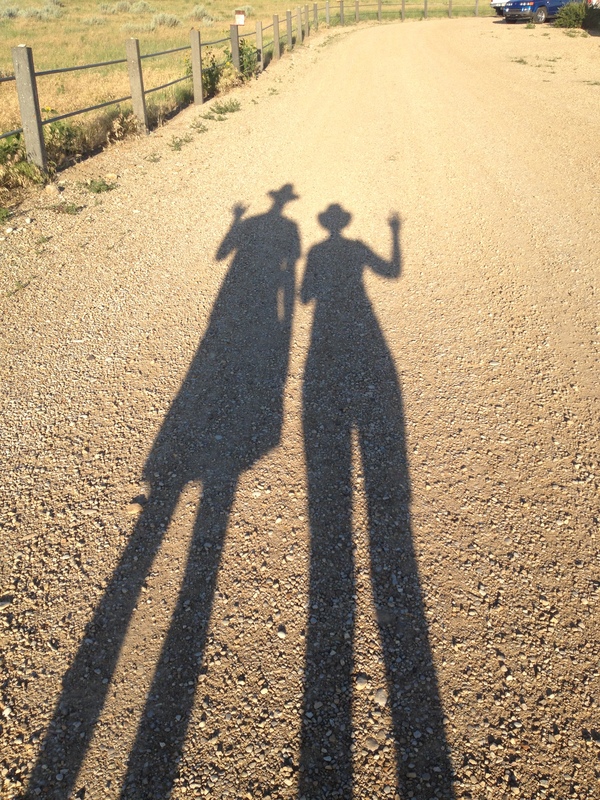 Summer is not over! Get your burger project started post haste! You will not be disappointed. Ok so many of you probably don’t remember this classic commercial from Heinz back in 1977, but I can tell you I was singing the jingle all day yesterday! 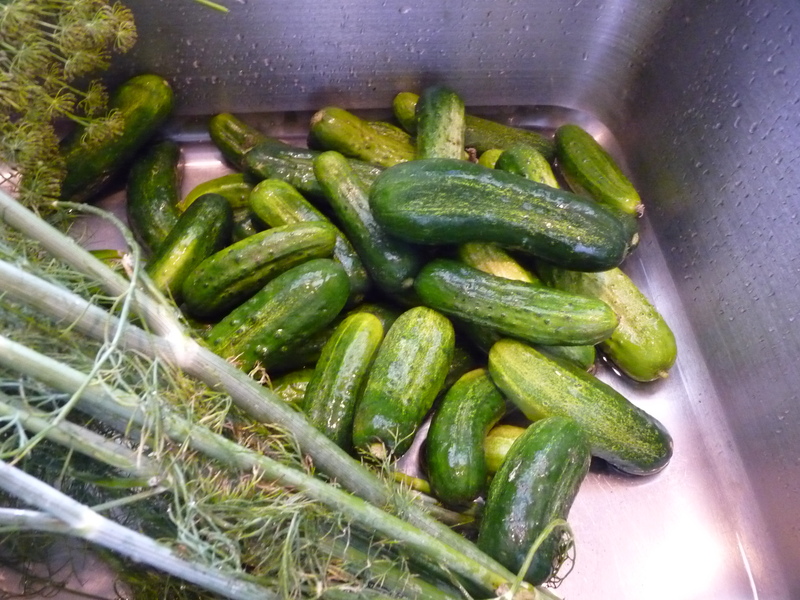 Once I got home the smell of fresh dill and sliced cucumbers filled the air. If you’re going to do a variety of pickles be sure to separate your cucumbers by size so you have uniform pickles. I used the longer ones to make the spears. I was so fortunate to have started my dill early from seed. 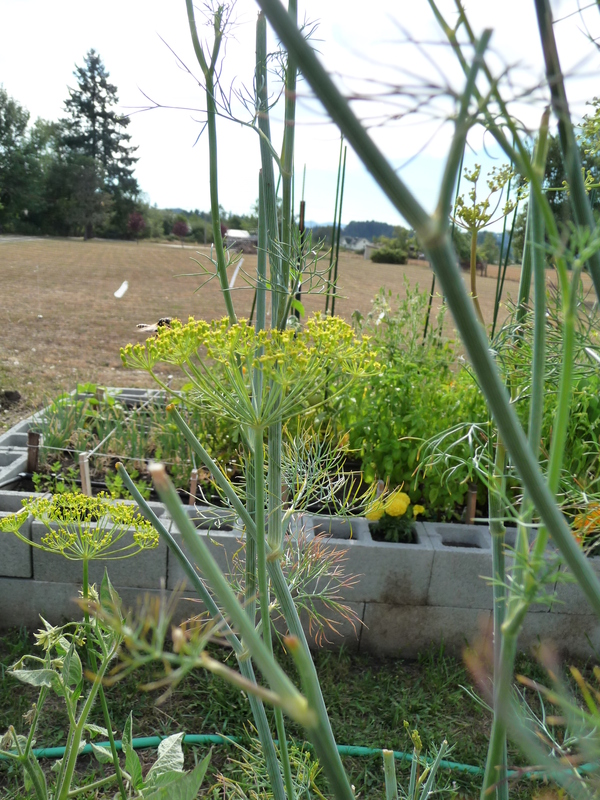 If you’ve not grown dill, or purchased it don’t confuse the dill weed you see in little packets in the grocery store. What you need are the blossoms! This is where the flavor is. Cut the yellow blossoms off and rinse them gently. You don’t want to wash all pollen off. I rinse them while on the stocks as it’s easier to control them. Then they get trimmed down to just the blossoms. The colors are just so vibrant. This is what they mean when they say “it’s yellow”. 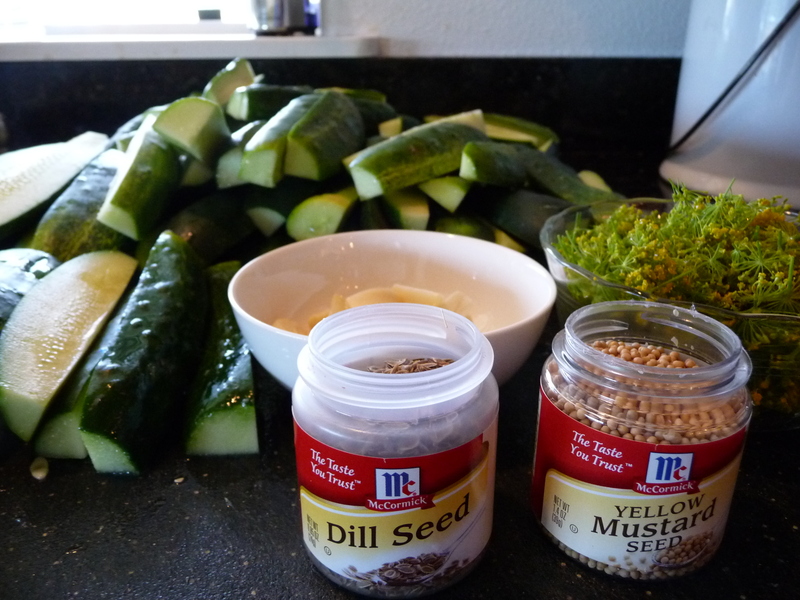 Other key spices for pickles are mustard seeds and dill seed, along with some tumeric, coriander, black pepper and a host of others. 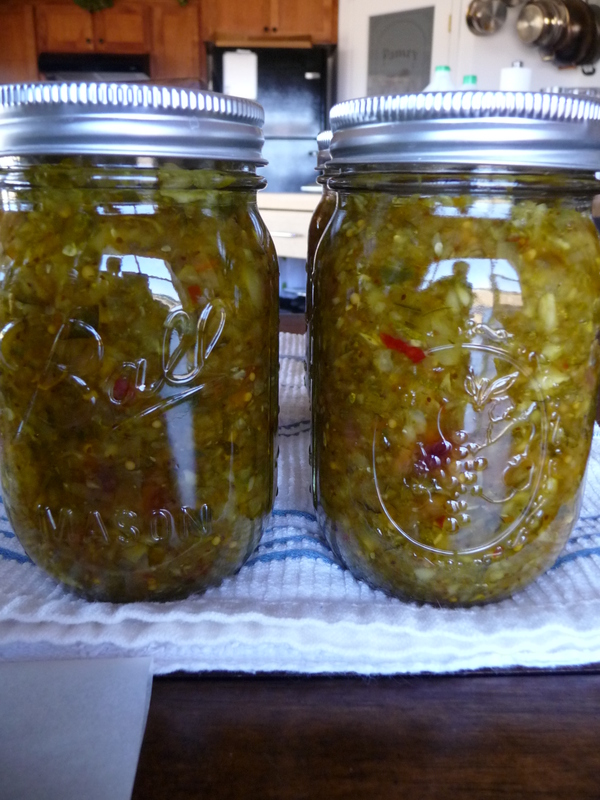 I find it’s much easier to buy a pre-made pickling mixture and enhance it to my tastes. In this case, dill and mustard. I don’t about you, but I so love it when I find a really good deli and get a sandwich that is made with good bread and a creamy mayo. However, if my plate doesn’t have a crunchy dill pickle on it I feel cheated. Pack them tight as they will shrink a bit during the process. I wish you could smell this. My next batch is going to be a long brine process. I want to do pickle tastings like wine tastings, at each phase in the process. It doesn’t take long and you will be rewarded with jars of Kosher Treasure. But don’t stop there! 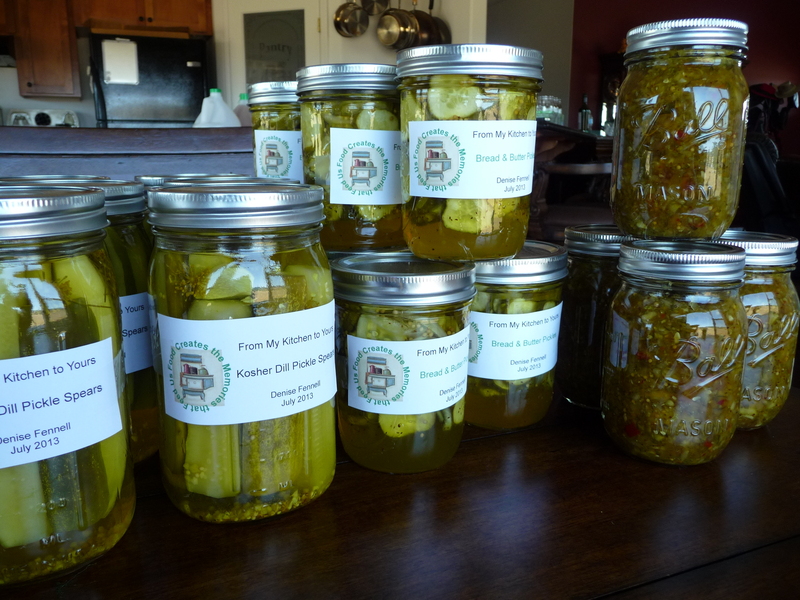 If you’re gonna make pickles, go big! Slice some up with some onions for Bread and Butter pickles. These are tangy with some sweetness that lends itself to be a perfect condiment with smoked meats! Enjoy these ‘coins’ with smoked meats and BBQ. I had a few extra cucumbers left over and I know how much hubby loves sweet relish on hotdogs. 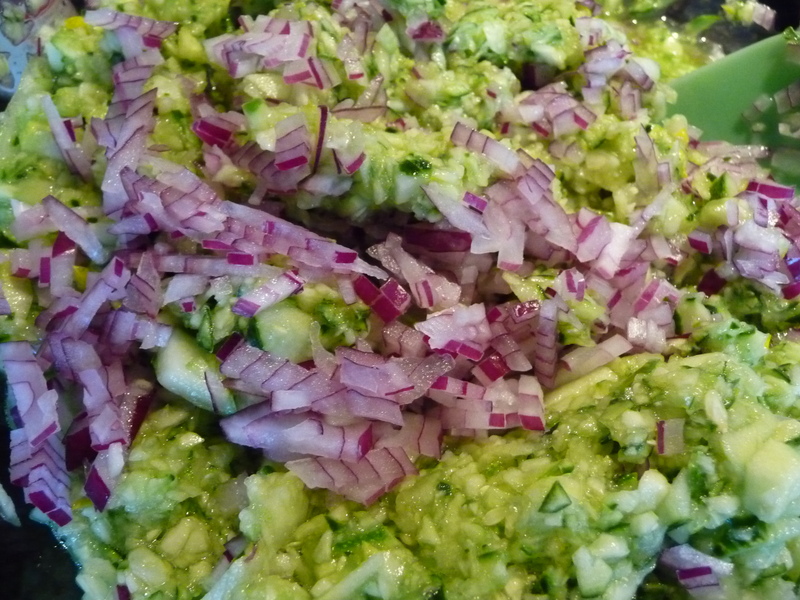 Make it easy and chop up the cucumbers in a food processor, add some red onion and then you salt them and let them sit for 2 hours. This softens them up before you cook them in the brine mixture. If you cook them for too long you’ll evaporate too much of your liquid. Cucumbers will start to release moisture right away. I love how the red onion and cucumbers look together. I am hoping for another large batch of cucumbers. So many options I want to try.